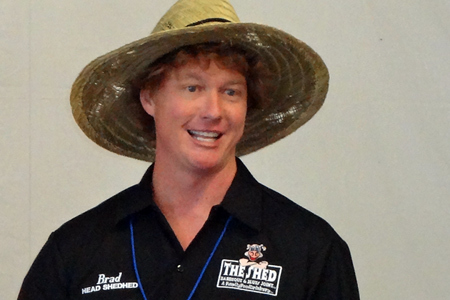 I've been excited to try the sauces from The Shed since I met the Head Shedhed himself, Brad Orrison, at the Kingsford Invitational last fall. Their restaurants have been seriously blowing up across the South. I'd seen Brad make a huge batch on Diners, Drive-Ins and Dives, and now I know what all the fuss is about. The Shed BBQ & Blues Joint in Ocean Springs, Mississippi was literally built from materials that Brad found by dumpster-diving and scavenging. Since then he and his sister, Brooke Lewis, have continued to build the brand, which now consists of three locations, franchises, and their own "saucery" (run by their father, Craig -- a great guy) where their sauces and rubs are made. In addition to their national awards and television appearances, they will have their own reality series on Food Network this fall. They sent me two of their sauces to review -- Southern Sweet ShedSpred, and Spicy Southern Sweet. They tout that their sauces and marinades are "junk free", which means, as Brad puts it, "If you can’t pronounce it or read it without the help of a chemist, don’t expect to find it on our list of ingredients!" They are all-natural, gluten free, and contain no high fructose corn syrup. This is a welcome departure from the garbage that's used in too many commercial sauces these days. Brad says that they like their barbecue sweet on the Gulf Coast, and these sauces definitely attest to that. The Southern Sweet ShedSpred (their signature sauce) is very sweet with some subtle spice notes and virtually no heat. Its somewhat thin consistency and sweetness make it seem to me like more of a glaze than a sauce, but that's really just semantics to most. If you like a sweet sauce that doesn't get in the way of the meat flavor, this one is for you. The Spicy Southern Sweet sauce was definitely my favorite of the two. It's sweet, but it has more spice and a mild heat at the back. The added spice really helps to compliment and round out the sweetness. The consistency is just barely thicker than the Southern Sweet. I tested the sauce on a chicken and ribs and, as you can see they provide a beautiful deep rich mahogany color. It goes on smooth and when you let it barely caramelize during the final few minutes of cooking they create wonderfully sweet and sticky finger-lickin' ribs. 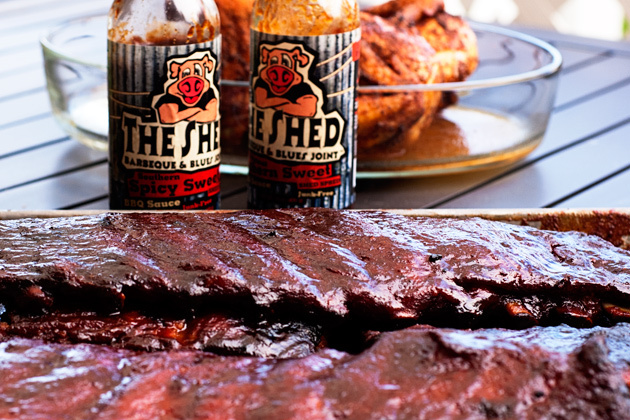 I recommend these sauces to anyone who wants to bring some seriously good Southern sweetness to their barbecue. They are available at select retailers nationwide and at their online store. Gitcha some! Of course you can also connect with them on Facebook and the Tweeter. Disclaimer: These sauces were provided to me free of charge for review, but the thoughts are my own. if you have not been to the shed you need to get there as fast as you can .go on a friday night for blues and BBQ you will have the best time you ever had . They did darn good with whole hog at Memphis In May this weekend. I'm with you, I really liked the Spicy Sweet one, great flavor with a kick.